Hamburg-America's Brasilia was built by Harland & Wolff of Belfast. Launched in November 1901, she made her maiden voyage from Belfast to New York on 21 March 1898. She was then placed on Hapag's Hamburg-Baltimore route, making 13 roundtrips on that route between May 1898 and October 1899. In February 1900, Brasilia was sold back to Harland & Wolff, who then sold her on to the Dominion Line. Dominion renamed her Norseman, eliminated the 300 second class accommodations she had had as Brasilia, and had her fitted as a steerage/freight ship for Dominion's North Atlantic service. (The refitting also included an increase in the number of masts, from two to four, as shown here.) Her first voyage for Dominion, though, was as a Boer War troop transport, in February 1900. 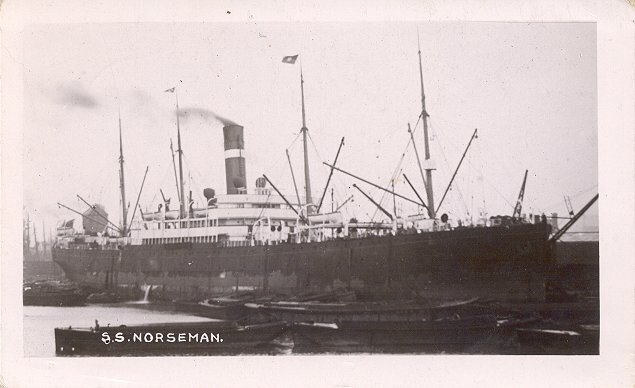 From 1910 to 1914, Norseman was chartered to the Aberdeen Line and sailed on a London-Cape Town-Sydney route. On 22 January, while en route from Plymouth to Salonica with a cargo of mules and munitions, Norseman was torpedoed by U39 in the Gulf of Salonica; she was towed to Mudros harbor, where she was again torpedoed and sank (according to Bonsor) or beached (according to Williams and Kludas). In any event, Norseman remained at Mudros until she was scrapped in 1920.